Things get more intense in Shade, the Changing Girl #3 as Megan/Loma feels the strain of being human. She tries to deal with the personal destruction Megan has caused, which is difficult because she does not have her complete memory. The story moves in a more emotional direction and away from the school-centric plot of issue #2. The art in Shade, the Changing Girl #3 continues to be stellar and the characters are becoming more solidified. There is still only a loose overall narrative, but that works so far. When Loma Shade the avian traverses into Earth, she lands in the consciousness of Megan Boyer, a comatose high school girl. Loma’s luck stinks, in this case, because Megan is a total mean girl. While her past actions were only hinted at in the first two issues, Loma now gets to see what Megan has done. Boy, the results are not pretty, as Megan seems like a serial harasser and bully. So it’s no wonder that most people hate her. Loma considers whether she should leave, but she believes Earth is her home now. So Loma tries to tap into the hate of Megan in order to survive amongst those who want to bring her down. The central set-up of the body transfer is pretty interesting, and we are starting to see it pay off. What happens when you wind up in the body of a horrible person? Loma seems rightly disgusted by Megan’s previous actions. At the same time, she IS Megan now. She has to live in her body, so she is on Megan’s side in some sense. While many versions of this story would have Loma try to make amends for Megan’s terrible past, Loma digs in. She perhaps sees that there is no way to make friends in this situation. She will use Megan’s talents to “charm and harm” and get through this life. This is certainly the juicier approach for a story. So I’m intrigued to see how Loma moves forward. 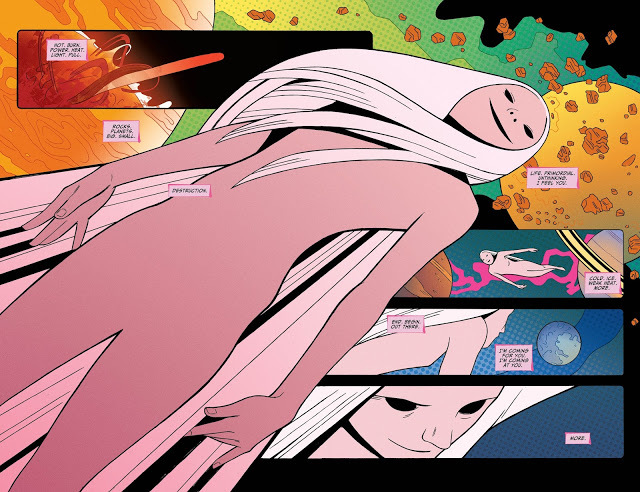 The other main element of Shade, the Changing Girl #3 is Lepuck Ledo on planet Meta. He is the only one who knows what has happened to Loma and the Shade coat. Lepuck has always liked Loma, though it doesn’t seem like the feelings were mutual. So Lepuck is carrying a number of weights. Lepuck comes across as a sweet slacker and is endearing. I think writer Cecil Castellucci could make the story on Meta more direct and clear, though. Overall, the plot of this series may be a weakness for some readers. It is somewhat difficult to explain what is the main narrative. 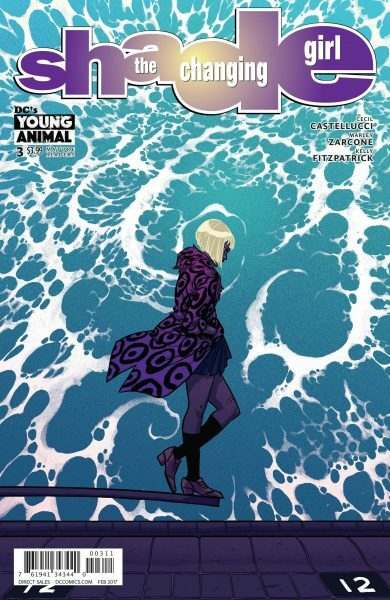 I don’t think Shade, the Changing Girl is the kind of series that is primarily about the plot. It’s about the characters, the mood, the art, and the language. However, I think Castellucci could still keep the emphasis on these elements while giving a better direction of what is at stake for Loma and those on Meta. Still, Castellucci does an excellent job of highlighting Loma’s struggle in Shade, the Changing Girl #3. It seems like living in the mind of another species is starting to drive her crazy. That anguish is portrayed nicely here without becoming overwrought. Consequently, Loma enters into Meta Meditation a number of times. These are the weird, abstract types of scenes that worked so well in the debut issue. They serve a different purpose here, and may not be quite as weird, but are more emotion. These meditations do give Marley Zarcone a chance to showcase her talents. Her art in Shade, the Changing Girl #3 is just as good as in the first. The second issue was less spectacular by necessity. However, Zarcone has great ability (especially when combined with colorist Kelly Fitzpatrick). So I think it’s a disservice to ask her to only draw classrooms and bedrooms. A huge part of the appeal of Shade, the Changing Girl for me is the art. I’d like to see Zarcone and Fitzpatrick given a chance to regularly draw the bizarre. I felt that the second issue was possibly heading into a more conventional story direction, centering on high school angst. Shade, the Changing Girl #3 is a course correction. We get more of the internal struggle of Loma and more of the problems on Meta. These are two elements that make this an unconventional story. So I think they should be central components. I’m glad to see Shade, the Changing Girl #3 feels more in line with #1. While the series could use a more established central plot, most of the other parts are working well.